Step 1 Preheat your oven to 230C. Whisk together the batter ingredients and 3/4 cup of water until smooth. Gradually add the last 1/4 cup and whisk until it becomes a smooth, thick "pancake" like batter. Add more liquid if needed (or more flour if too thin). Step 2 Dip the florets in the batter, drip off any excess, and then coat with quinoa flakes. Lay them on a lined baking tray and bake for 25 minutes, until evenly crispy. Step 4 Once the cauli-wings have browned, remove from the oven and begin coating each wing in the glaze. Coat evenly first, then simply spoon any remaining glaze over each one on the baking tray - finishing with approximately two coats on each piece. Step 5 Place back in the oven and bake for a further 15-20 minutes until slightly crisp edges and sticky. Step 6 Serve immediately and enjoy. 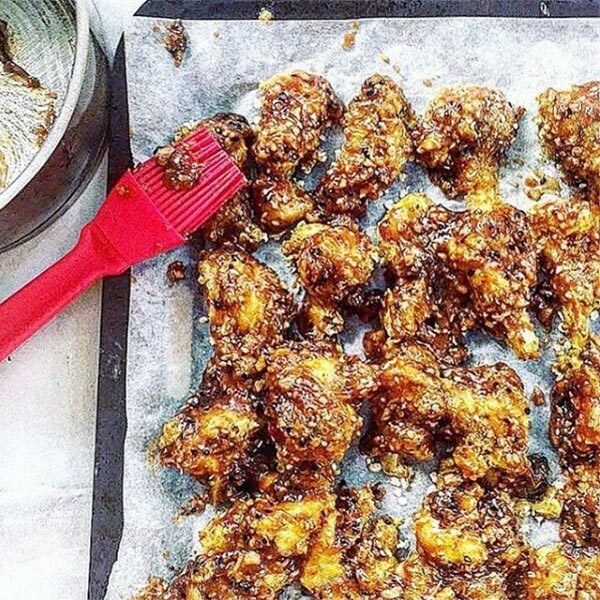 These sticky cauliflower "wings" are an absolutely delicious vegan alternative to chicken wings. Enjoy a tasty full-flavoured sticky coating and a soft, melt-in-your-mouth centre.